This map will give you some idea of the lay of the land. 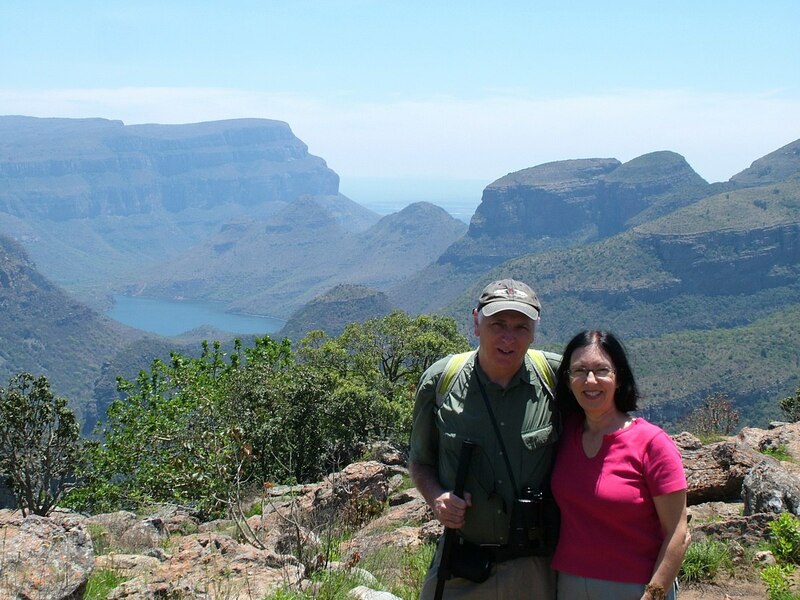 To the north of Sabie is the Blyde River Canyon Nature Reserve that encompasses this, the third largest canyon in the world, and marks its significance as one of South Africa’s most notable natural features. 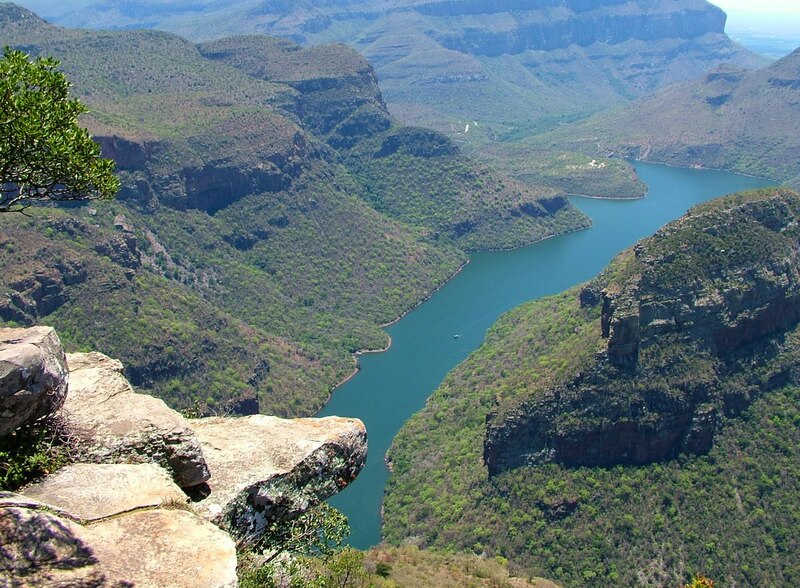 The Blyde River Canyon forms the northernmost end of the Drakensberg escarpment. All along the route, overlooks provide views of incredible rock formations, and, in most cases, the towering walls of the canyon disappear into the depths of the gorge so far that we were unable to see the bottom. 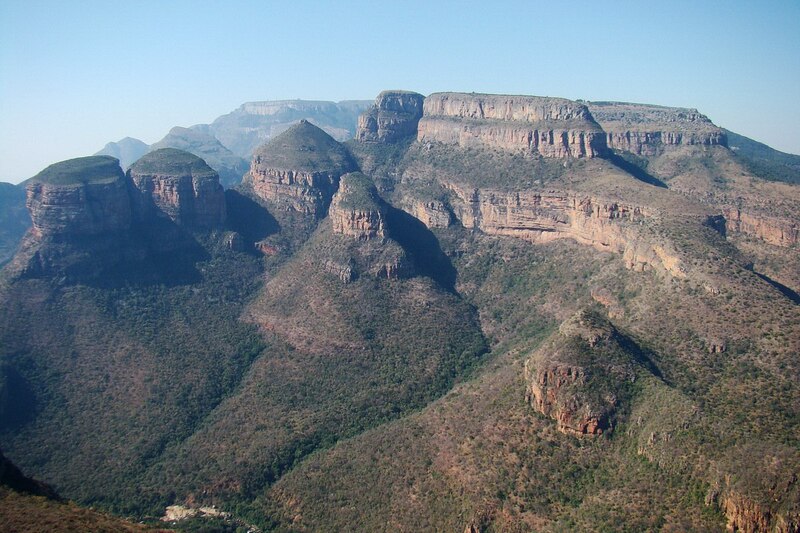 There at the northern end of the Blyde River Canyon sit the Three Rondavels or the Three Sisters as they were once called. Even earlier in history, the three cone-shaped peaks were called Magabolie, Mogoladikwe and Maseroto after the three wives of a legendary Bapedi Chief, Maripi Mashile. 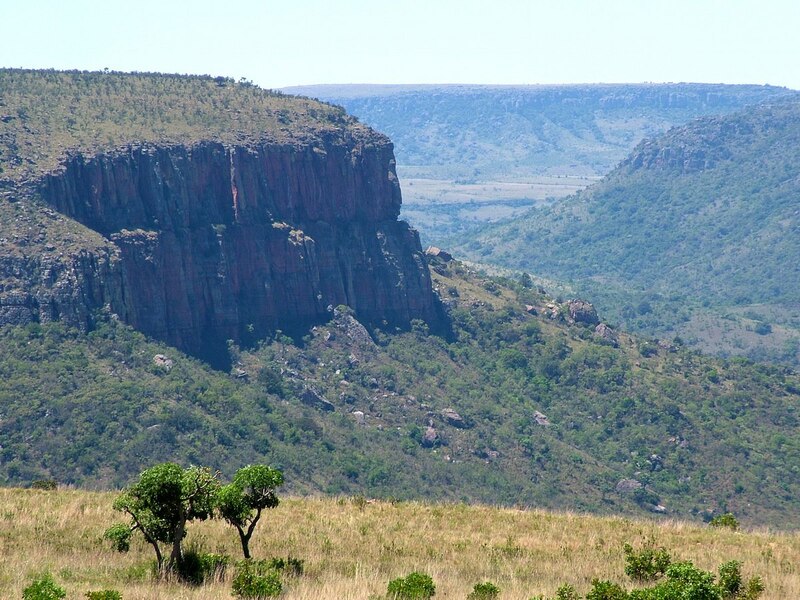 The nearby flat-topped peak bore the name Mapjaneng (The Chief) after he defeated invading tribesmen from Swaziland in an epic battle. but people were able to wander at will along the edge of the canyon in both directions. Of course, great care had to be taken because of loose rocks, and we were ever vigilant to keep an eye out for scorpions and snakes. You can imagine how I jumped out of my skin when a sudden flash of movement near my feet was observed out of the corner of my eye. This Common Flat Lizard had me sidestepping quickly until I realized what was skittering about. There are 9 subspecies of this lizard all living in South Africa with subtle differences in the coloration of the males making differentiation difficult. 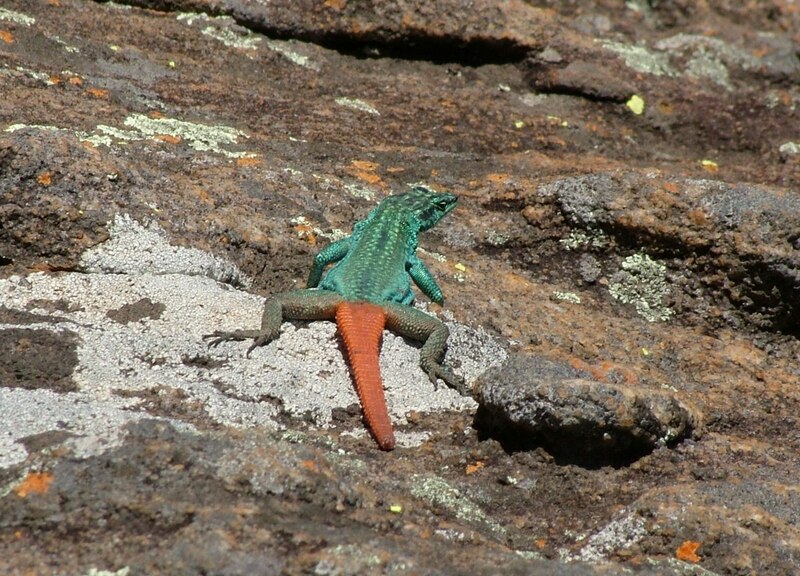 The habitat there at the edge of the canyon was ideal given that these lizards like to live among granite, sandstone and quartzite rocks, especially near rocky outcrops. 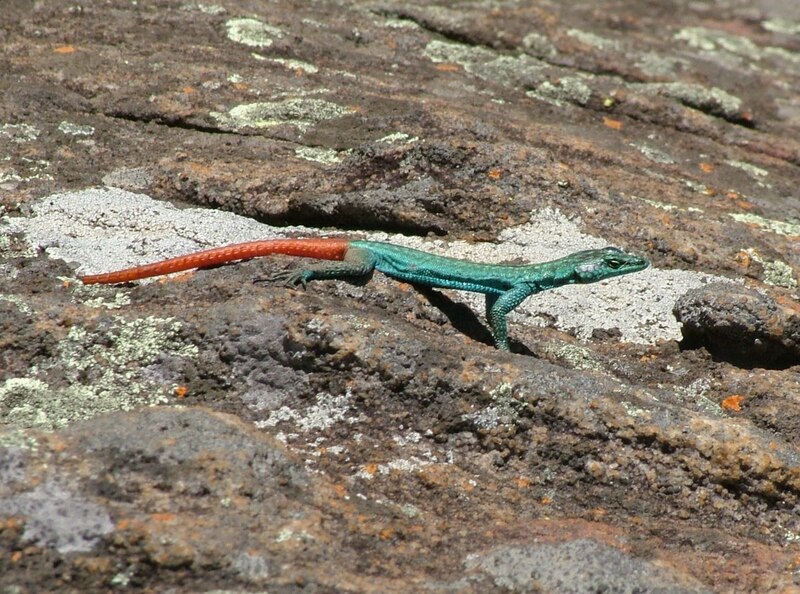 This would not be the only time we came across these colourful little creatures on our trip. A further example of local wildlife flew into a bush growing up out of the dry sandy soil, and with assistance from people who are more knowledgeable about South Africa’s native flora and fauna, I am able to tell you that this is an Arrow-marked Babbler, juvenile. 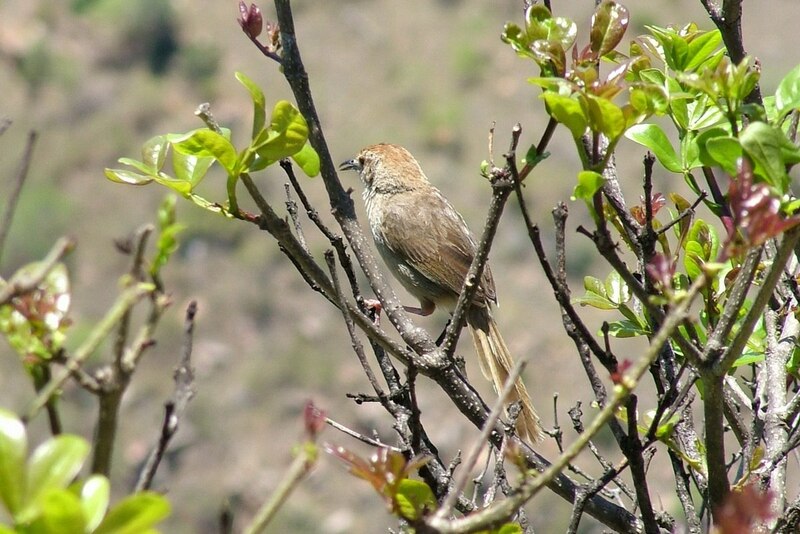 The plumage on the throat, neck and head of an Arrow-marked Babbler is white-tipped giving rise to their common name. The male and female of this species look the same. 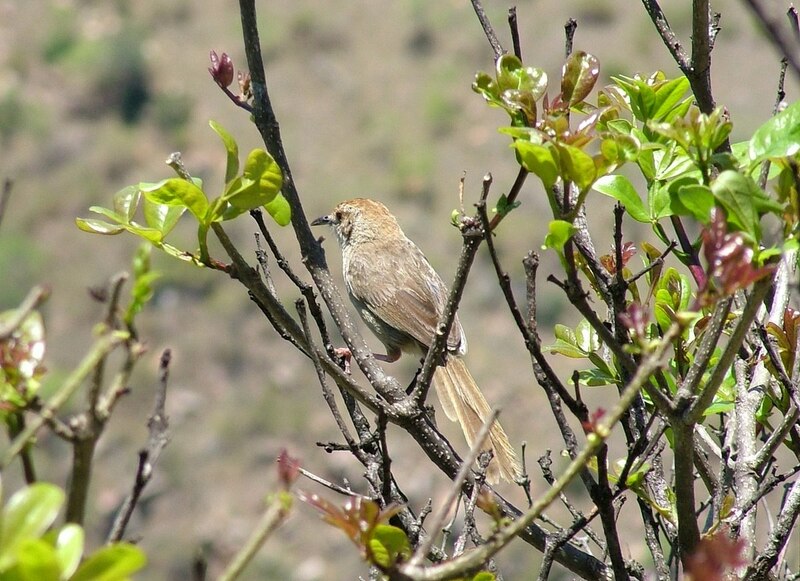 Arrow-marked Babblers occupy a variety of subtropical and tropical habitats that include dry forests and savannas where they are typically found in strips of denser vegetation that erupt along seasonal sources of flowing water. These birds like to forage in thickets and near the ground for insects and spiders, but they will catch the occasional lizard to supplement their diet, so perhaps the presence of the Common Flat Lizard that just scurried beneath a rock is what drew the Babbler to this perch in the first place. 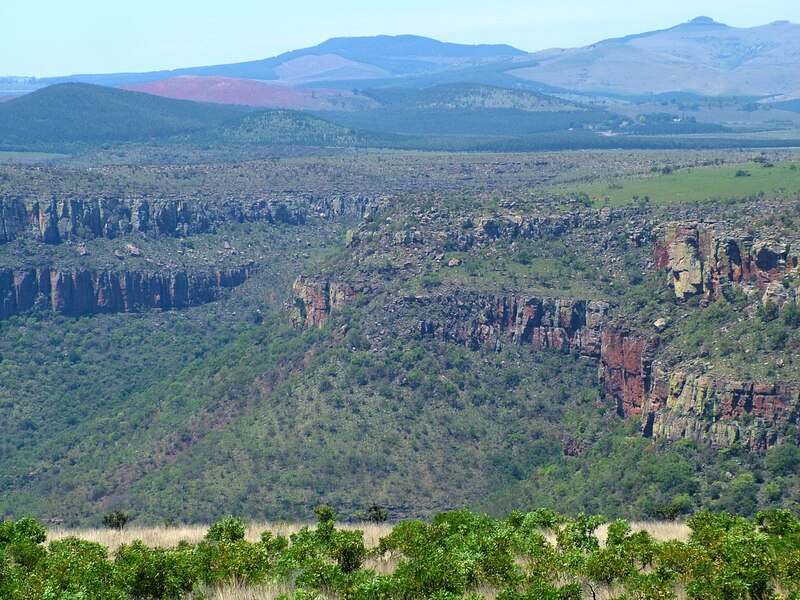 Red sandstone underlies the Drakensberg escarpment, and over the centuries, erosion has worn away the soft, underlying stone while leaving behind the harder slate and quartzite. 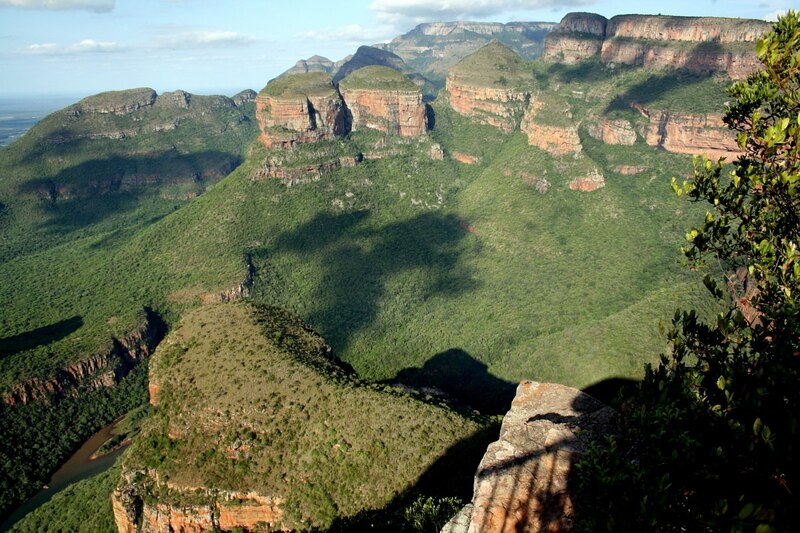 That is what has given rise to the various significant and dramatic rock formations seen along the length of the Blyde River Canyon. 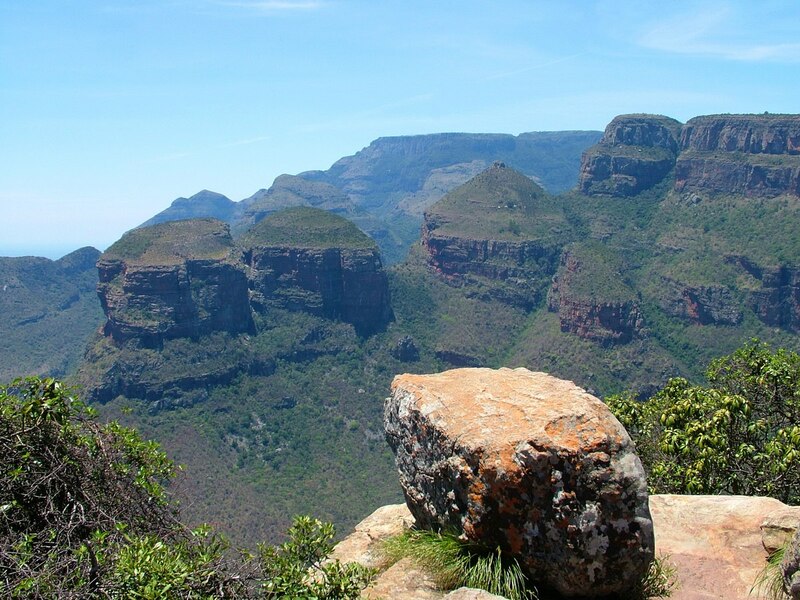 The reason these naturally-formed “mountain islands” are called rondavels is because their shape resembles that of traditional African thatched huts that have been built and used by the indigenous people for centuries. The beehive-shaped huts are squat, conical, and circular rising to a pointed top, so there is good reason that these natural formations are compared to them. 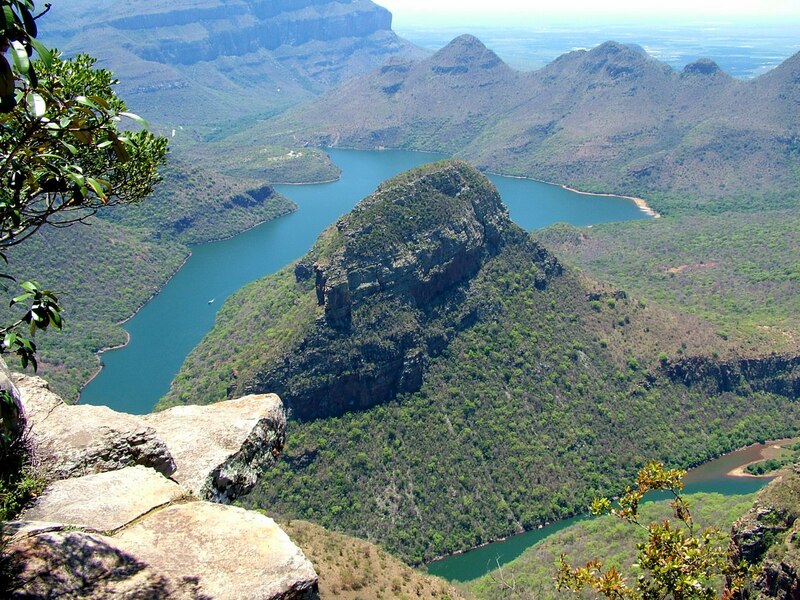 This trio of geological formations presides over the Blyde River where it disappears into the Blyderivierspoort Dam, an artificial reservoir. From our vantage point on that crisp, clear day, the water in the canyon took on the most beautiful turquoise blue hue. 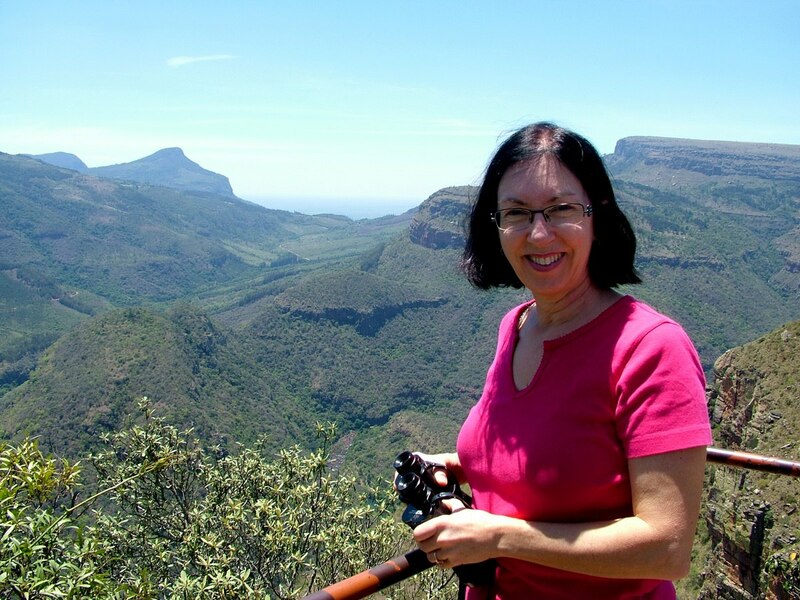 The lookout sits at 1,380 metres (4,527 ft) above sea level and allows a fantastic view of the virgin forests growing thick on the slopes of the canyon. 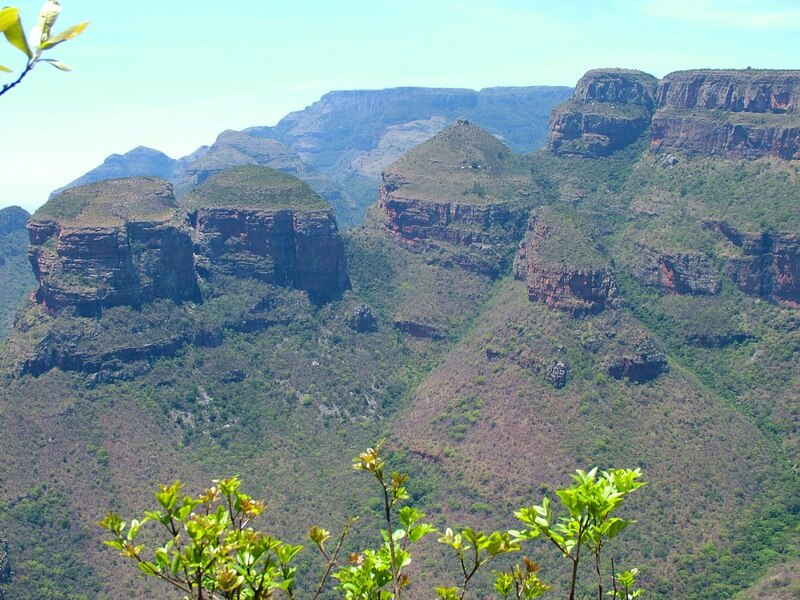 The three distinctive peaks of The Rondavels tower an additional 700 metres (2,296 ft) above the surrounding countryside. 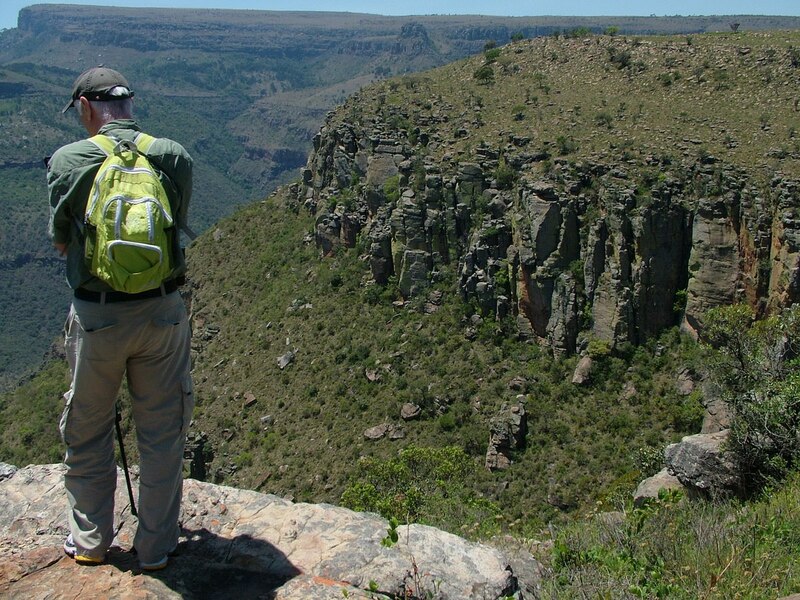 As Bob contemplated the vertiginous drop to the Blyde River below, my attention was riveted on an unexpected flurry of activity nearby. A group of school children had arrived on the scene, and their bubbling excitement overflowed in giddy laughter as they jostled for position at the guardrail. 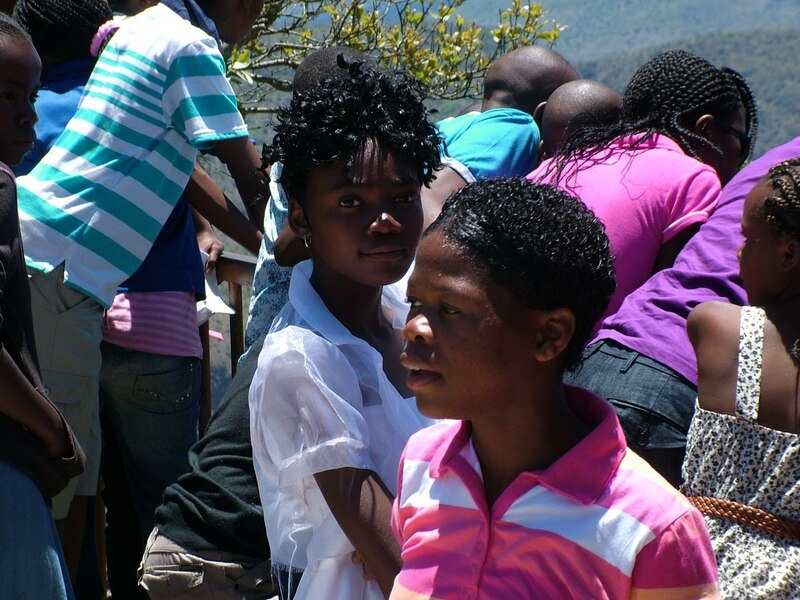 A bus had brought the children on a planned excursion from Nelspruit, and each was dressed in their finery. The girls had some of the most intricate and elaborate hairstyles I’ve ever seen. 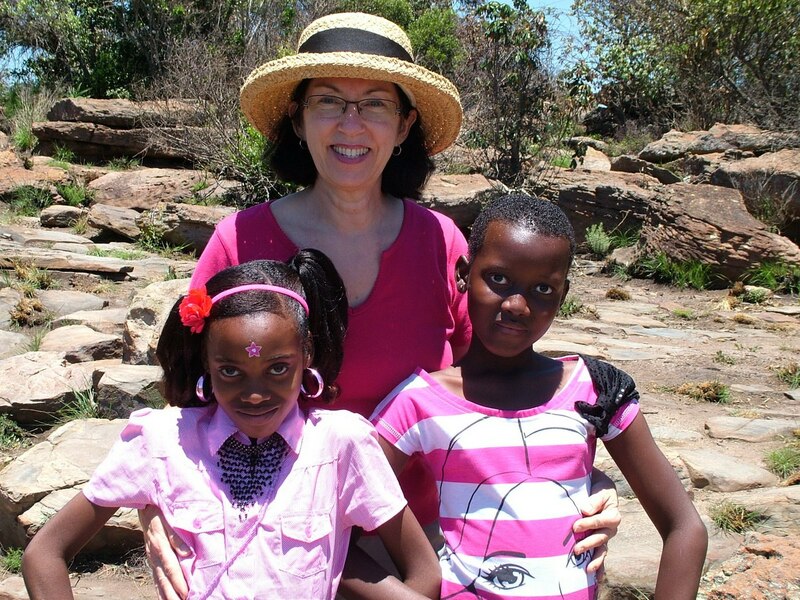 In speaking with the teachers, I was surprised to learn that their school had participated in the Sister Cities Program with Evergreen Elementary School in my hometown of Toronto , Ontario, Canada. The idea that it’s a small world came home to rest. While posing for another photo in front of this magnificent backdrop, I happened to notice nearby a couple of interesting plants. I had been so focused on the view that I nearly missed them. 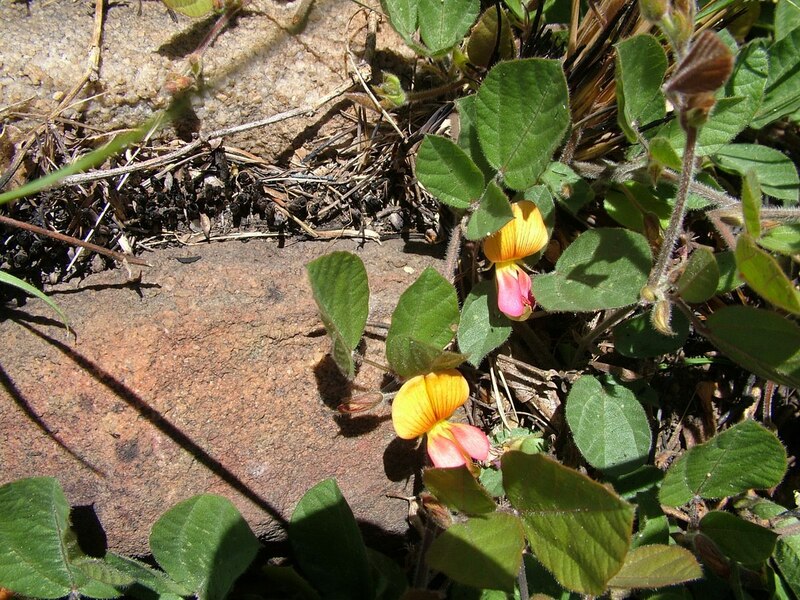 I had no idea at the time that these hardy plants are called Snoutbean (Ryhnchosia monophylla). This trailing perennial herb thrives in a multiple of different habitats including sandy, stony soil and granite slopes and is supported by a strong, woody root. These plants only grow at elevations between 1,050-1,750 metres (3,445-5,741 ft). Normally, plants such as this would be a familiar sight in a garden center back home, but here was one growing where it is meant to be. 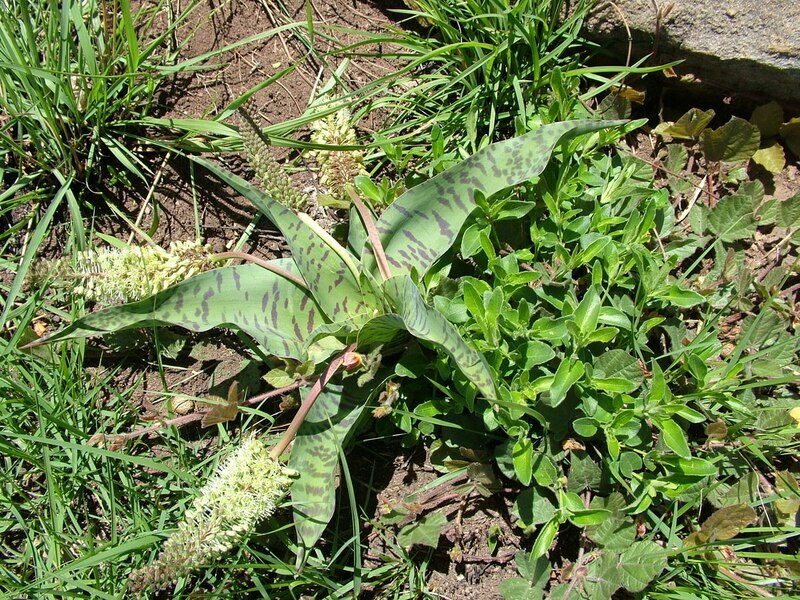 Giant False Scilla or Giant African Hyacinth as it is commonly known is scientifically regarded as Ledebouria zebrina. Although I didn’t kneel down to check for myself, the masses of tiny, greenish-white flowers, that are produced in the early spring, are said to exude a lovely sweet scent. It is the handsome broad leaves with dark, purple-brown stripes or spots that appeal to homeowners who want an exotic looking houseplant. Bob and I shortly thereafter retreated back towards a small market set up near the entrance gate for our first bit of shopping. All of the vendors were either the artists themselves or were related to them. 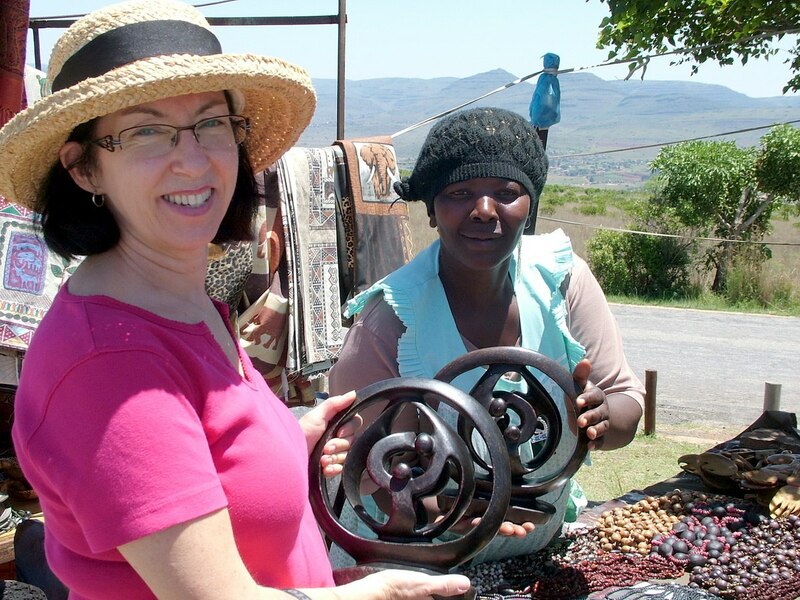 I was enamoured with the creations sculpted out of shona stone by this lady’s brother. We purchased two of these representations of family, albeit two different designs. 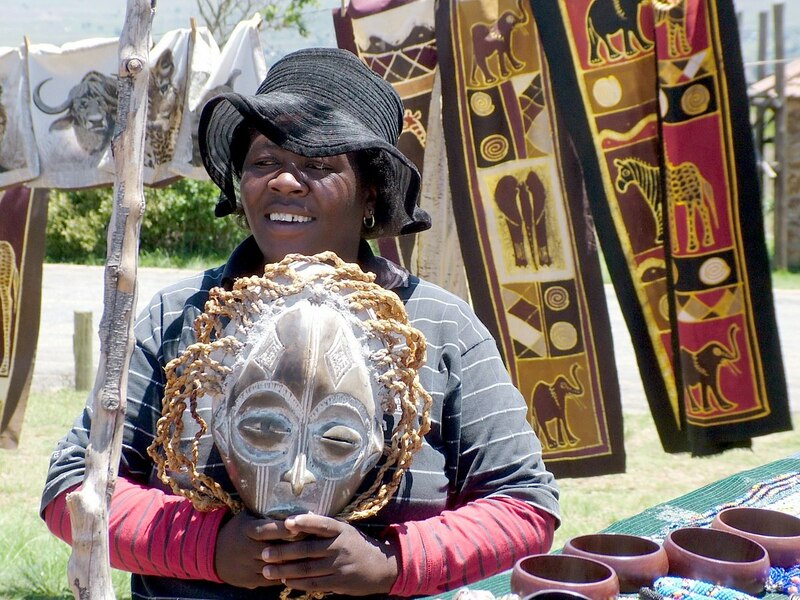 The Zulu mask that this woman is holding is fashioned from wood, and as all of them are handcrafted by the Zulu, their know-how results in a very smooth, hard finish. The mask is not intended to represent a human hence the extra long oval face features narrow slits for eyes and is decorated with patterns and lines. In keeping with tradition, the mask is finished in natural earth tones. It was interesting to learn that the masks used by Zulu tribes were meant to satisfy their ancient beliefs or meet spiritual requirements as opposed to being worn as or employed for decoration. 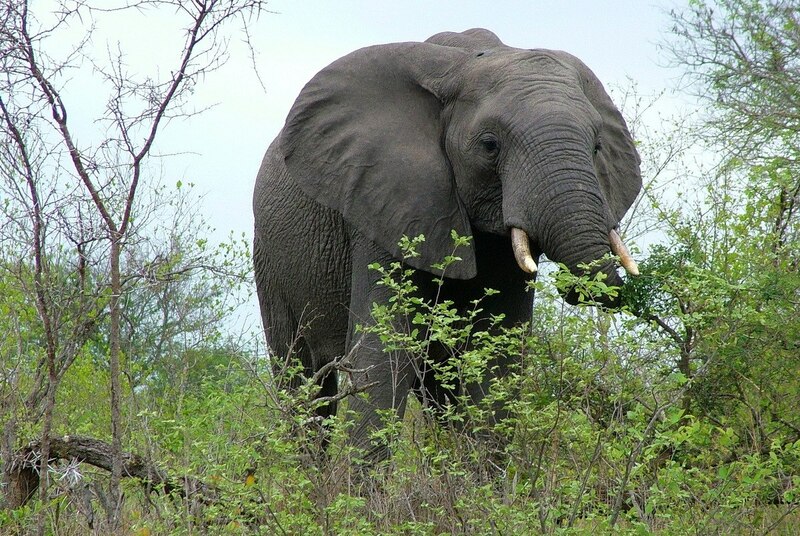 The varied uses include holding a secret, guarding a house, warding off evil spirits and attracting good luck. 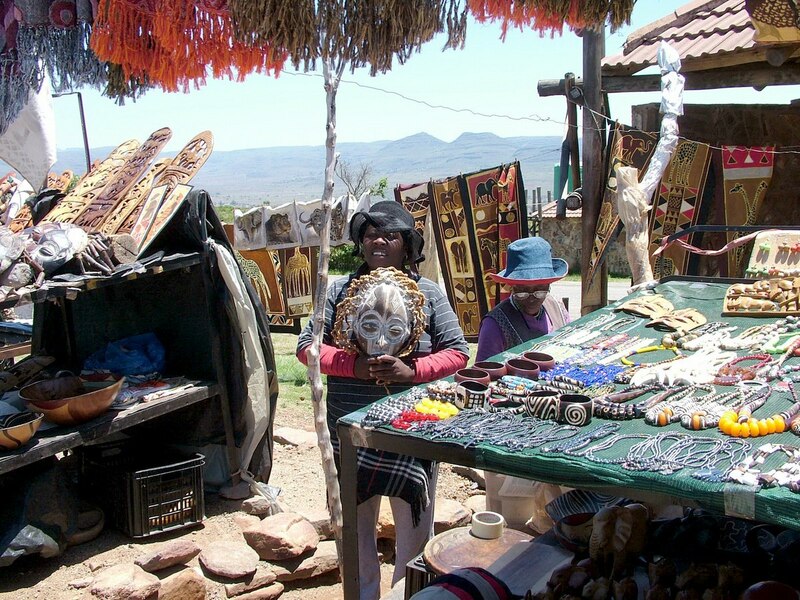 The masks are regarded as an important part of the Zulu culture. 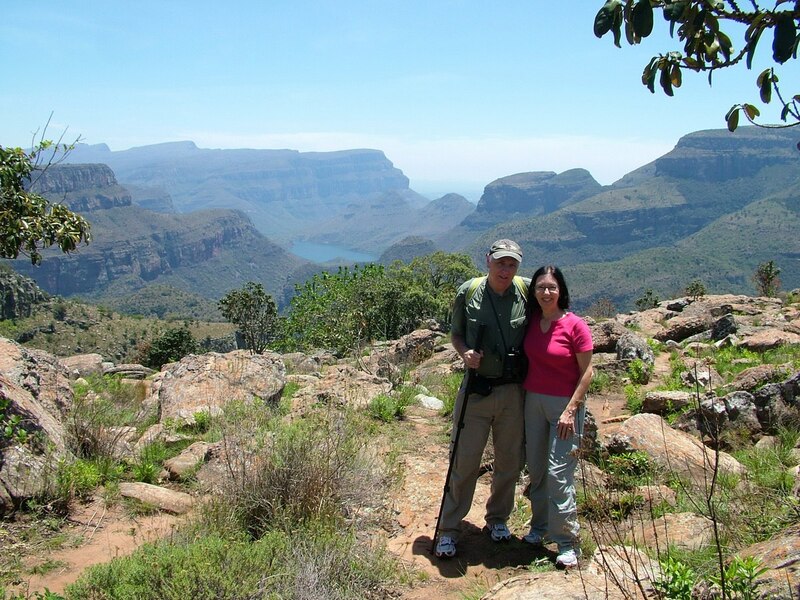 Our visit to the Three Rondavels certainly was the culmination of our tour along the Blyde River Canyon. These three huge pinnacles of rock that rise above the canyon below left an indelible image in our memory as they stood guard over the deep, deep tree-lined river valley.